In 1695, Chökyi Döndrub was born to a Nepalese family in Yolmo, in the Kingdom of Nepal. As a child, he described in detail his past incarnations and the monasteries which belonged to him. The Eleventh Karmapa Yeshe Dorje sent an envoy with precise instructions on how to find the Shamar incarnation. With the permission of his parents, he was taken to Tibet at the age of seven, and enthroned by the Karmapa as the Eighth Shamarpa. He received the full transmission of the lineage from the Karmapa who passed away that same year. He continued his studies with the third Treho Tendzin Dargye, Goshir Dhönyö Nyingpo and others. Having collected and later transmitted teachings from a great number of gurus, the eighth Shamarpa was a particularly important lineage holder. 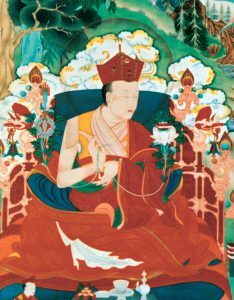 He accompanied the Twelfth Karmapa Changchub Dorje on pilgrimage to Nepal and India, and later to China, upon the Karmapa receiving an invitation from the Emperor. It was on this trip to China that both the Shamarpa and the Karmapa contracted smallpox and passed away within two days of each other. The Karmapa was only twenty-nine years-old and Chökyi Döndrub, thirty-seven. Chökyi Döndrub had transmitted the full Kagyu lineage to the Twelfth Karmapa, Changchub Dorje and the Eighth Tai Situ Rinpoche.